Life is hard. We all know that. We all have things we want to accomplish in our lives: deeper relationships, better fitness, starting the new business, and on and on. What makes it hard is that there are so many distractions, so many excuses, and our goals just never seem to become a reality. My guest today, Steve Kamb, founder of Nerd Fitness, shares how his love for video games and movies helps us overcome distractions, procrastination, and excuses, and become the hero of our own journey. Men, please let me introduce Steve Kamb, the founder of NerdFitness.com. 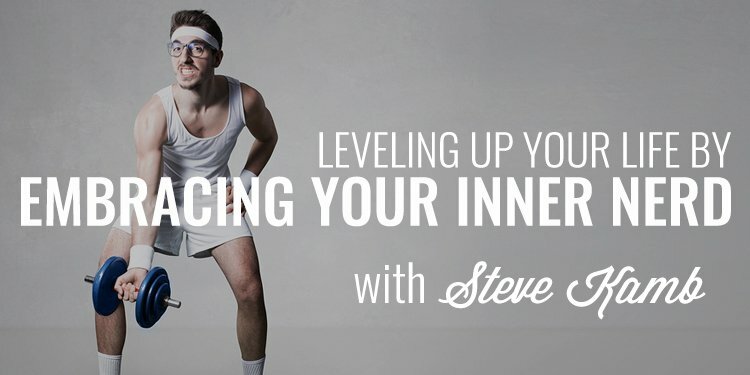 Steve has built an amazing community of over 350,000 men and women across the planet teach them how to level up in every area of their lives. Steve combines his unique perspective on life with his love for video games, TV, and movies to help average joes and jills improve their lives. Steve Kamb is also the author of the recently released book, Level Up Your Life: How to unlock adventure and happiness by becoming the hero of your own story. On a side note: He hopes to one day become Captain America.